For GMs in need! When you need a PC right now, The Emergency Character Collection comes to your rescue—whether you had a PC perish mid-adventure, a friend drop in for your game, or just want a stable of fully-statted NPCs. The Emergency Character Collection includes thirteen detailed characters, each ready to play with printable character sheets for levels 1, 3, 6, and 9. Each complete PC comes with an illustration, roleplaying hooks, design notes, quick customization tips for different campaign types, interesting variants, and an in-game justification for appearing right on scene, right when you need it. But what will you really get? 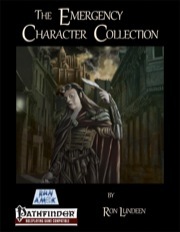 If you want a taste of what The Emergency Character Collection has to offer, this free sample contains two of the thirteen PCs: Caffey, a shrewd human urban ranger, and Janakath, an inquisitive catfolk paladin. Just print and play! The Emergency Character Collection is written by Ron Lundeen, with art by Marco Morte and Blake Wilkie. Will be added to your My Downloads page when your order ships. This pdf is 87 pages long, 1 page front cover, 1 page editorial, 1 page ToC, 1 page SRD, leaving a total of 83 pages of content, so let's check this out! We've all been there. There's this awesome module we're playing in. The adventure works just fine. And then - boom! A cruel twist of fate. A bad roll of the dice. A critical hit to head with a scythe. A ton of rocks on the head. A sewer-gas explosion. An assassin's knife to the back. Damn. Resurrection is not an option, either due to circumstances of the death, the campaign setting or group finances. It's off to character creation again. Only: You don't have a character in reserve. But damn, you want to play! Or perhaps a friend who moved away is in town and wants to roll dem bones again, but has no character ready. This is where this book comes in, providing a selection of a total of 13 different NPCs. It is noticeable from the get-go that each character comes with a mug-shot in b/w as well as full stats and gear. A sidebox also details traits, wealth by level and increased point-buy-options for the respective characters - each one of them, thus enabling you to potentially modify them on the fly and already taking the tedious starting-treasure-selection off your chest, if you're so inclined, that is. Now, each of the potential PCs herein comes with short information on appearance, personality and behavior in combat as well as enough space on the page for hit points, conditions and modifiers as well as general notes, cramming the full stats of the character on one page without making it feel bloated - probably thanks to the concise and easily navigated presentation. It should be noted though, that due to the length of higher level statblocks, the respective higher-level incarnations have less room for notes (or none at all), conditions etc. on the page necessitating an additional piece of paper. Furthermore, each of the characters comes with a suggested way of getting them into action right now via teleportation mishaps, proximity etc. What higher level incarnations? Well, to maximize usability, each of the characters presented herein comes in 4 different versions: One at level 1, one at level 3, one at level 6 and one at level 9. So, what kind of characters do we get? We get Aleksandros, a zealous human battle oracle, Adeniel, an elven witch (who in the revised version ow includes stats for her fox familiar for all levels) and Caffey, a human urban ranger (with information on adding the skirmisher archetype. The archetype-information is cool and I wish each of the characters would come with one, but formatting-wise, it's a problematic: You only have to print out one page per character to use them, that's the layout's goal - and it succeeds. However, to preserve this unity of presentation, the information for on the fly appliance of the archetype is presented on its own page - almost lost amidst a lot of white space that could have at least been filled with more boxes for notes. The dwarven cleric Foscrim also suffers from this, providing information on 3 variant alignments and respective domain spells in a similar manner - which is doubly a pity since he comes with an intelligent phylactery of faithfulness at higher levels (with full stats) that would have made an excellent legendary item that scales with his levels. All those advocates of weird races and feline friends will enjoy Janakath, a noble catfolk paladin that comes with full information on how to change the noble warrior alternatively into an antipaladin. Lat Keth, a half-orc monk is another rather interesting character, as he comes with a vow of poverty that utilizes an interesting idea: Essentially, he has built-in bonuses AS IF he owned level-appropriate gear due to his vow, but they can't be stolen and stack with spells. However, he may not use respective items and gear. I'm not sure I'm sold on this particular one, since the bad memories of the Book of Exalted Deed's utterly broken poverty-mechanics still linger in my mind. I simply did not have the time yet to properly judge the repercussions in game of this approach to the vow and thus can't fairly comment on whether the approach is balanced or not. What I can, though, is advise DMs on working with potential players of Lat Keth and make sure that the limitations imposed on the character by the vow are strictly enforced. Half-elven Arcane Duelist Bard Lhostra Dragonblood makes for an interesting character especially for players all into draconic heritage etc., especially if her alternate progression is taken: At 6th and 9th level, she has multi-classed into the dragon disciple PrC and may actually have a forest drake cohort, for which we also get full stats (though also half a page of blank space). A more straight-forward gish than Lhostra then would be Osmer, a tiefling magus who also comes with rules to balance the tiefling-race in a low-powered group vs. the other races as well as information on making a scarred half-orc out of him. Quorena, an elven fighter, is the obligatory eleven archer with a secondary focus on melee and comes with full information on flipping the focus from ranged combat to melee. Speaking of iconic roles bordering on cliché: Of course, there's also a halfling rogue, one named Tedric. His level 9 build can be changed to rogue 6/assassin 3 and honestly - his dashing mug-shot makes him look badass -cool! Speaking of badass: Thura Thunderbirnger, a dwarven gunslinger with a Vampire Hunter D-hat can also be changed into a human pirate via the information contained herein. Vinkia, halfling druid, also is rather interesting: The druid comes with full stats of her juvenile roc animal companion from the starts as well as information for replacing the roc with the animal domain. In a n act of sheer brilliance, the juvenile roc not only is presented with full stats for all levels, we also get TWO versions of the character's presentation - one with all stats lumped together on one page and one that seperates the presentation of the animal companion's stats and that of Vinkia - a great and awesome way of ensuring that whatever your taste is, the pdf delivers. I wish all companies would do something like this in respective publications.The final new character introduced would be Zarastar, Gnome Sorceror with a celestial bloodline and his trusted signature summon, Blinky: A celestial dire bat that comes with full stats. Blinky is awesome. My players probably would love the critter as much as Misk's Boo. And in the revised version, Blinky is supplemented by another signature summon for lower levels, Filbert, the friendly celestial eagle. Awesome! Editing is top-notch, I didn't notice any glitches. Formatting, though, is a slightly troubled subject, at least for me: First of all, I really like the ambition to get all the stats on one page for maximized usability. However, the lack of space for notes etc. on higher-level versions of the characters slightly impedes the otherwise stellar usability. This is how a revision is done: Lacking Witch familiar stats? Now included! Minor layout issues (blank spaces, unused space, lack of stats for familiars/companions at certain levels)? SOLVED (or at least minimized! Layout adheres generally to a 1-column, landscapeish presentation of the fluff next to the portrait of the character, clearly separated from the mostly 2-column-presentation of the crunch. Layout per se is printer-friendly b/w with corresponding artworks that can be considered nice and run the gamut from awesome to slightly goofy. The pdf comes fully bookmarked and now comes with nested bookmarks that make navigating the file much simpler - again: Kudos for listening and quickly improving! There's unfortunately still an extremely annoying formatting peculiarity that resurfaced for me with Adobe Reader X: While perfectly readable in print, it takes some configuration to properly display the text, otherwise you'll see certain letters and combinations of letters as bold. I usually wouldn't complain about that, but since Adobe is still the assumed default, I figure the problem should be addressed sooner or later by using another variant of the font. This collection of characters is very useful for its intended purpose and would also make for a good starting ground for DMs who want a rival NPC-group sans work - just take some of these guys and gals and there you go. It's also a slight pity that we don't get a sample inquisitor or a sample summoner. I am honestly blown away by how much this revised edition of the emergency character collection has improved - from bookmarks to actually MORE content to the fact that we now may even choose between two layouts regarding a character that has more crunch information than the other, this pdf has improved significantly - enough to bump my final verdict up by an additional star and clock in at 4.5 stars - there still are some minor issues like the font-glitch in adobe, but content-wise, almost all minor issues I had with this collection have been eliminated. While falling slightly short of 5 stars and having minor room for improvements, I am confident that Run Amok Games will make Vol.II, if it ever comes out, a true joy to behold. For now, I'll round down to 4 stars for the purpose of this platform. Thanks! I hope everyone finds this a useful product. If you're wondering what it's like, check out the free sample! Thanks for the review, End! This is helpful if I ever put together this type of product again. It's a bit out of my usual focus of adventures, but it was a lot of fun to do! Excellent news! I'll look at the revised file and adjust my review accordingly. Thanks so much, End! I'm glad our improvements bumped this up a full star!